Club Penguin Cheats by Mimo777 Club Penguin Cheats by Mimo777: Club Penguin Underwater Expedition Ad! 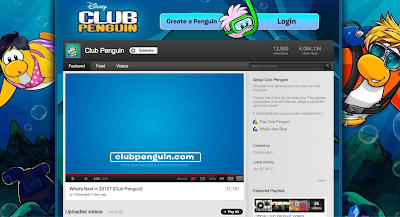 Club Penguin has now updated their You Tube channel to promote the Underwater Expedition! So cool! Are you ready to "conquer the maze?" If the island is going underwater, isn't herbert going too?? mimo when it shows the island at the home page you can see rockhopper! does that mean we get to meet rookie and rockhopper? This is a really great way of promoting their party! Please visit my site and post a comment and I will add you on Club Penguin! Please post if you are cool! I like the fact the beach and lighthouse are pulling that end of the island down. Does anyone have any guesses how everyone using anvils is supposed to help? Make iron supports for the lighthouse and create an underwater room (maybe for EPF) at the same time? Girlyhockey2 said if the island is going underwater isnt herbert going too?? Mimo already postd about this. Mimo when you go to check on herbert in the EPF headquarters there is a shadow of a palm tree on him go check! There has been a party like this before! Yup there was! It started back in 2006, and then there was one in 2007. This will be the first since 2007. It has been there since the beginning: google club penguin herbert sleeping. I just came on a idea while I thought about the party! When there will be the party, they will tilt the island to make the lighthouse and beach go underground. And they probably use anvils for that, right? "We thought the whole island might get flooded after the crab cracked the glass in the Underground. But some smart penguins hooked up hoses and turned it into a big water party! There were water balloons, water polo, and big fish bowls for igloos. Some artistic penguins even built a blue rubber whale that squirted water. The party was a splash." Ahh!Water Party!One in 2007 when the crab cracked the window and then one in 2008 to celebrate the first.I remember! LOL! look at the boy yellow penguin in the background of cp's youtube channel. He's wearing a bikini.